For all the authors out there, here’s a little help! I am very glad to welcome Madi Preda to Fiction Favorites. 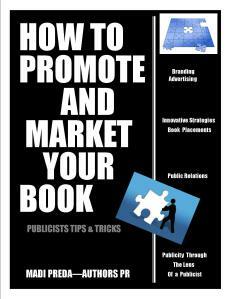 Madi is the author of the book How to Promote and Market Your Book, as well as principal of Author’s PR . She has managed the campaigns of over fifty books this year alone. Here’s Madi. Word of mouth is the best way to amplify your efforts and create interest about your work and it’s free. All you need for word of mouth marketing is a good book, worthy of sharing, and a strategy to get it into the hands of the right people who will spread the word for you. It sounds simple but is not that easy and requires some time, efforts, and determination. 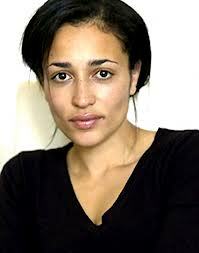 A few days ago I stumbled upon a youtube video by Zadie Smith. It was a lecture given to students of the Columbia University’s Writing Program. In it, she distilled ideas on her method of writing. Some of which I thought was insightful, and others remarkably pleasing. I post it here only as a means of sharing her insight, not to copy her work. Watch the video here, when you get a chance. 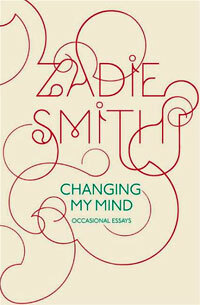 Or read her novel, Changing My Mind where it is also included. Here, I present part of the lecture in the form of a mock interview. I am a Micro Manager. I start at the first sentence of a novel and I finish at the last. It would never occur to me to choose among three different endings because I haven’t the slightest idea of the ending until I get to it. Do you have a cheering squad? It’s such a confidence trick, writing a novel. The main person you have to trick into confidence is yourself. This is hard to do alone. I gather sentences round, quotations, the literary equivalent of a cheering squad. Except that analogy’s screwy – cheerleaders cheer. Do you read while you write? It’s a matter of temperament. Some writers are the kind of solo violinists who need complete silence to tune their instruments. Others want to hear every member of the orchestra – they’ll take a cue from a clarinet, from an oboe, even. I am one of those. I read lines to swim in a certain sensibility, to strike a particular note, to encourage rigor when I’m too sentimental, to bring verbal ease when I’m syntactically uptight. I think of reading like a balanced diet; if your sentences are baggy, too baroque, cut back on fatty Foster Wallace, say, and pick up Kafka, as roughage. Do you ever tinker with the first twenty pages? What’s amazing about the first twenty pages is how little confidence you have in your readers when you begin. You spoon-feed them everything. You don’t trust the reader to have a little patience, a little intelligence. This reader, who, for all you know, has read Thomas Bernhard, Finnegans Wake, Gertrude Stein, Georges Perec – yet you’re worried that if you don’t mention in the first three pages that Sarah Malone is a social worker with a dead father, this talented reader might not be able to follow you exactly. For writers who work with character a great deal, getting back to the first twenty pages is also a lesson in how much more delicate a thing character is than you think it is when you’re writing it. What should a writer do when they are finished writing their novel? When you finish your novel, if money is not a desperate priority, if you do not need to sell it at once or be published that very second – put it in a drawer. For as long as you can manage. A year or more is ideal – but even three months will do. Step away from the vehicle. The secret to editing your work is simple: you need to become its reader instead of its writer…You need to forget you ever wrote that book. Well, that brings us to the end of the discussion. I hope you enjoyed the interview. Remember to check out the rest of the lecture, either on youtube or by reading the book. I send my best regards and keep up the great work. Meet you back here next week!